After last week’s article on in-house pay versus partner pay, I heard from dozens of attorneys who had further questions about the difference in compensation between Biglaw and in-house postions. I want to address some common follow-up questions. What do non-general-counsel positions pay? Corporate in-house departments are tiered like law firms. Generally, the general counsel is the top attorney in the company, also sometimes referred to as chief legal officer. Their duties skew more towards management, strategy, and advising. Occasionally, companies have multiple general counsel if they have subsidiaries, or they may choose to refer to these as associate general counsel. Depending on the importance or size of the subsidiary, secondary GCs can be paid either comparably to general counsel, or far less, but I have not come across one paid more. Next in line is the deputy general counsel, who is second in command. Deputy GC (or CLO) positions tend to pay between two-thirds and three-quarters of what the GC is paid. Companies might have multiple deputy general counsel, or they might have none at all, depending on the size of the companies. The size of the law department tends to scale linearly with the size of the company. Under them are the division heads, the counsel of M&A, chief privacy officer, chief IP counsel, and so on. 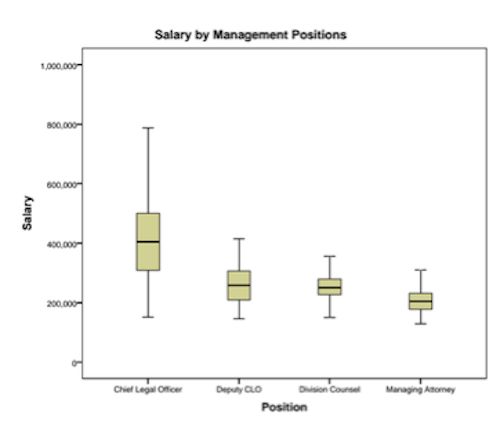 These tend to make the same or close to the deputy general counsel, but their pay range is less volatile. 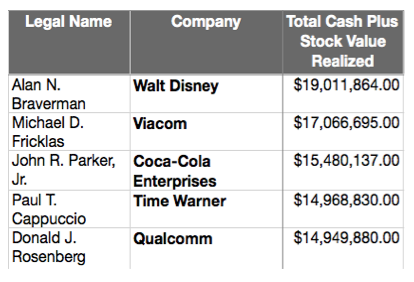 It’s hard to generalize across such a broad spectrum of companies due to the financial disparities. Some companies pay their GCs in excess of $10,000,000 in total compensation, but the next highest-compensated attorney could be paid less than one-tenth of that. Biglaw tends to operate in a similar manner: firms with lower PPP generally can’t afford a partner making three standard deviations above average, while some of the high-leverage ones have pay disparities between the lowest- and highest-compensated partners that reach the double digits. Which industries pay the most? It is easy to generalize industries by their pay, but its inherent meaning is more complex than numbers. Barriers to entry can make certain industries top heavy and therefore skew GC compensation upwards while other industries might have a surfeit of GC positions, driving compensation below average. For example, beverage companies paid on average $15,000,000 in cash and stock compensation, according to a 2014 survey by American Lawyer Media (ALM), but there was only one such position available. Pharmaceuticals was the most commonly represented industry on the Fortune 100, but paid closer to the overall average, giving their general counsel $4,302,284 a year. The correlation coefficient between revenue and total compensation is .11, a negligent correlation. Similarly, the correlation coefficient between base salary and revenue is .22, slightly stronger but still largely insignificant. While compensation largely scales on a macro scale, from small companies to behemoths, within the Fortune 100, as well as similarly sized companies, the pay of general counsel depends on a myriad of factors including the company’s need, lawyer’s competence, legal department size, and supply and demand. Who are the highest-paid general counsel? As we covered last week, general counsel are paid in a variety of manners; their compensation is usually a mixture of salary, bonus, and non-cash incentives (usually equity). Because of these differing compensation packages, determining who earns the most, year-to-year, is often dependent on the company and attorney’s performance. For base salary, Gerson Zweifach of News Corp. (Fox) pocketed a cool $3,000,000 in ALM’s 2014 survey of Fortune 100 companies’ general counsel. In second was GE’s Senior VP and General Counsel, Brackett Denniston III, with $1,650,000 in base salary. As far as stocking stuffers go, John Finley of Blackstone got a healthy $4,212,555 yuletide bump to offset his relatively conservative base of $350,000. Other large bonuses were paid to Gary Lynch of Bank of America ($3,260,000) and David Drummond of Google ($3,000,000). Two last forms of payment are stock options and awards. Awards are paid out but require a set period to vest — giving the employee extra incentive to stay during that period — while options sell the company’s stock to the employee at a fixed price and amount. Awards are more common than options within the Fortune 100, but most general counsel are compensated with a mixture of both. Frank Steeves of Emerson Electric was awarded $5,218,930 in stock. The highest amount of option awards for the year went to Brackett Denniston III, who took home $2,486,000. As I mentioned last week, there are myriad factors that come into play when benchmarking in-house compensation. If you are currently negotiating your compensation package, feel free to reach out to me on LinkedIn and we can schedule a time to chat. Although Lateral Link specializes in attorney placement with law firms and in-house legal departments, we engage in compensation conversations as part of our day-to-day jobs, so we have a wealth of data points that may help you navigate negotiations.